An excessive level of vitamin D has been found in some Hill’s canned diets for dogs—these include Science Diets and Prescription Diets. While vitamin D is an essential nutrient for dogs, overconsumption of it can lead to potential health issues, which are dependent on the level of vitamin D consumed and how long a dog has been exposed to this overabundance. Symptoms generally stop when the food is discontinued, and in most cases, complete recovery is expected once consumption has stopped. 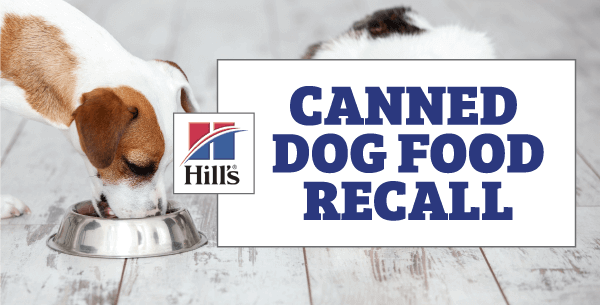 Please note: we have no way to track diets that were purchased elsewhere, so we encourage you to look at the recall list and check your dog’s food carefully (because recalls sometimes expand, please check the list often to make sure new foods have not been added). If your pet’s food is on the list, you MUST stop feeding them the food and return unused cans. If your dog is on a prescription diet for a medical problem, it is imperative to contact us so that an alternative can be found. Do not switch to a store-brand diet without consultation or your pet’s treated medical problem could worsen. If you have any concerns about the diet recall, please let us know. It has been 12 years since a veterinary-prescribed diet has had a major recall and we know the stress and difficulty that this causes for you and your pet. You can view the full recall list here. For any questions or concerns, please do not hesitate to contact us at (405) 696-4185.